Writing speeches is a lucrative and interesting genre for freelance writers and career writers. The question of how to become a speechwriter is one I get quite often, as speechwriting — writing speeches for others to deliver — is a potentially lucrative area for freelance writers. Freelance writers make themselves and their career infinitely more stable by adding skills and services to their offerings, and this could be an area that you explore. 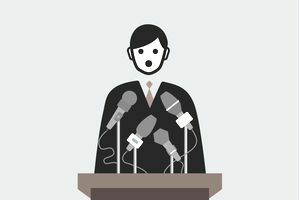 The audience and potential clients who need speeches aren't limited to the political arena. Writing speeches also means you may work with executives, philanthropists, athletes, or PR and management agencies. There is a political element to this, too, and a writer could potentially specialize only in political speech writing if desired. The Bureau of Labor Statistics says that the median for a speechwriter is about $75,000. Keep in mind that this is likely for a full time, 8am to 5pm+ staff position. Freelance speechwriters will need to consider how much time and effort they want to invest in this position, and weigh the option of taking a full-time position. There are many different types of speeches. We tend to think of speeches that are made to convince the audience of something- such as those that surround our elections. Consider other places you've seen speeches: conferences, commencements. Sometimes speeches are meant to thank important donors or to trace histories or stories of buildings, organizations or groups. Start small, even free, offering speeches to community groups or on a volunteer basis. Think about joining a Toastmasters or other speech group/club. Volunteer to work in other capacities on campaigns and in elections. This gets you introduced to the "right" people for your future. Seek out local speechwriters for mentoring. Ask after the arc of their career. How did they "get here"? Break down famous speeches on your own, without leaning on a book to tell you the "why" and "how" of the speech. Speechwriters often come from other career fields like journalism and writing, consider those career paths, too. If you want to be a political speechwriter, consider writing other political material, such as op-eds, press releases, and campaign brochures. Start building up that writing portfolio. Keep your own unique sound and voice (especially if you're already an accomplished writer. Have an opinion, but be able to give equal weight to different opinions. Sometimes you'll be able to choose or shape the beliefs inherent in your speech, and sometimes you won't. Be ready to write things that you don't quite believe or that aren't quite "true." If you're still in high school or college, consider joining debate teams or political clubs. Speechwriters must be especially open to critiques of their work, as it usually goes through several people before its final delivery. Attend the speeches that you write, if possible. Audience reaction to your work is immediately observable and multiplied by volume. That's some valuable writing critique at your fingertips! Think like a singer and take care of your voice. Be ready to get along with different kinds of people- people who are political, opinionated, famous. Keep your vocabulary well-rounded and fresh by reading and listening to others' speeches. Consider co-opting your opponents' language (which may be divergent from yours) but spinning to your own uses. Like other freelance writers, speechwriters need to be able to write about a wide variety of subjects. This means you'll need serious research skills (unless you've got a vast store of knowledge in your noggin). As with any writing, you'll need to successfully target your audience. Consider the first parts of your speech to be your headline- you'll need to capture the audience immediately from the start. There's no "skipping ahead" when it comes to listening to a speech.